After delaying nearly two years, the Pentagon on Monday announced plans to deploy advanced missile defenses in South Korea as soon as possible. In early 2014 the U.S. military commander in South Korea, Gen. Curtis Scaparrotti, asked the Pentagon for ground-based Terminal High-Altitude Area Defense (or THAAD) units to counter growing threats posed by North Korean nuclear arms and missiles. China’s government, however, pressured the South Korean government of Park Geun Hye into blocking the deployment. In the interim, the Obama administration did not press Seoul to allow interceptor batteries to be fielded, according to U.S. officials. Scaparrotti repeated the need for the missile deployment in a statement Sunday. "North Korea continues to develop their nuclear weapons and ballistic missile programs, and it is the responsibility of our alliance to maintain a strong defense against those threats," he said. 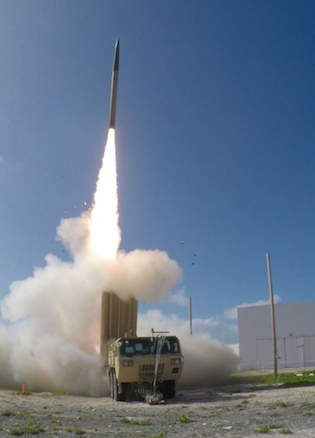 "THAAD can add an important capability in a layered and effective missile defense." Pentagon spokesman Peter Cook told reporters that discussions on the deployment were prompted by North Korea’s long-range missile test Sunday and underground nuclear test last month. Cook said the missile launch "represents yet another destabilizing and provocative action that only undermines peace and stability in the region." 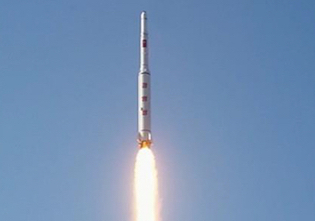 North Korean state media claimed the rocket launch successfully deployed an earth observation satellite in polar orbit. The U.S. Strategic Command, which is in charge of missile defenses that had been placed on alert days before the missile test, said the command’s assets tracked a "missile … on a southerly route over the Yellow Sea" and a "launch into space." A Stratcom statement said two items have been detected in a polar orbit, a possible satellite and a second object believed to be the last stage of the missile. As a result of the tests "an alliance decision" was made to begin formal talks on deploying the high altitude missiles, which would be operated by U.S. Forces Korea, Cook said. The talks are centered on deploying the missile system in South Korea "at the earliest possible date." "We'd like to see this move as quickly as possible, but we're beginning the consultations now in the coming days with the South Koreans and we expect that this will move in an expeditious fashion," he said. The high altitude missiles are widely regarded by analysts as very effective against ballistic missiles. The system uses hit-to-kill interceptors capable of knocking out incoming missiles in the final stage of flight. The system can hit missiles around 125 miles away and at altitudes up to 93 miles. The system consists of truck-mounted launchers and interceptors, an advanced radar, and command and control equipment. Batteries of the missiles are currently installed on Guam in the south Pacific. The system can be networked with Aegis anti-missile firing ships and ground based Patriot missile defenses. Cook made no mention of the two-year delay in meeting Scaparrotti’s request for the missiles, but said the interceptors in South Korea would be "focused solely on North Korea." China reacted to the announcement, in both Seoul and Washington, by criticizing the planned deployment and saying it is "deeply concerned" by the plans. "China holds a consistent and clear stance on the anti-missile issue," Chinese Foreign Ministry spokeswoman Hua Chunying was quoted as saying by the Xinhua news agency Sunday. "When pursuing its own security, one country should not impair others’ security interests." China has engaged a regional strategic influence operation aimed at derailing the deployment, according to U.S. officials. The influence operation has included promises from Chinese President Xi Jinping to increase trade and financial investments with South Korea if the missile defense system was blocked. However, the Obama administration policy of giving China the lead in dealing with North Korea’s growing nuclear and missile program has failed to curb Pyongyang’s ambition of seeking missiles capable of striking the United States with nuclear warheads. In the days leading up to the long-range missile test Sunday morning, a senior Chinese official, Wu Dawei, traveled to Pyongyang seeking to prevent the destabilizing missile test. South Korea’s Park also directly appealed to Chinese leaders in a phone call last week to use Beijing’s influence on the regime of North Korean leader Kim Jong Un to halt the missile test. After China failed to prevent the nuclear and missile tests, the South Korean government decided to change course and support deploying the advanced U.S. missile batteries. China opposes U.S. missile defenses in Asia, asserting that the THAAD system, when networked with other regional radar, satellites, and sea-based anti-missile systems, will be used to counter China’s large-scale missile forces. The Communist Party-affiliated Global Times newspaper, which reflects official Chinese policies, said that the deployment of the missiles in South Korea would threaten Beijing’s security. China will take steps to counter the missile defense deployment, the nationalistic newspaper stated in a Sunday commentary. "China will reinforce its capability to cope with the Korean Peninsula from going out of control, including dealing with military threats from THAAD," the paper said. 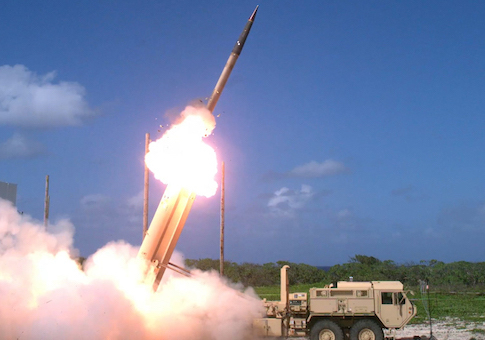 "If THAAD takes root in South Korea, it will be officially considered as a target of research by the Chinese military from both the strategic and tactical dimensions. We cannot be easily convinced by South Korea and the U.S. that the system only aims to deter North Korea." President Obama, in a television interview broadcast Sunday, said he spoke to Xi, the Chinese leader, a few days before the launch and urged him to "really tighten the noose" on North Korea. "But what we're also doing is consulting with the South Koreans for the first time about more missile defense capabilities to prevent any possibility that North Korea could reach U.S. facilities or U.S. populations," Obama said on CBS News. Obama also sought to play down the missile launch, noting it was anticipated. "They are not very good at feeding their people, but they invest a huge amount in their weapons systems," Obama said. The United Nations Security Council, as it has in the past, held an emergency meeting on Sunday and condemned the missile launch as "a clear threat to international peace and security." The world body has imposed an array of economic and political sanctions on North Korea for its nuclear and missile tests. The sanctions appear to have had little impact. On Capitol Hill, Republicans criticized the Obama administration’s policy of "strategic patience" in dealing with the dangers posed by North Korea. "The president's reluctance to face these dangers with resolve, much less a strategy, only allows them to proliferate," said House Armed Services Committee Chairman Mac Thornberry (R., Texas). "Seven years of underfunding for U.S. missile defense have given our adversaries uncontested opportunity to advance their capabilities." Rep. Mike Pompeo (R., Kan.), a member of the House Permanent Select Committee on Intelligence, said the North Koreans continue to defy the international community and United Nations. "We have no more time for President Obama and former Secretary Clinton’s failed policy of ‘strategic patience’ towards the dictatorship in Pyongyang," Pompeo said. "We must respond swiftly to this provocation with stinging sanctions against the regime, which Congress is preparing, while continuing to stand with our allies, particularly South Korea, and support them in their self-defense," he added. Rep. Mike Rogers (R., Ala.), chairman of the Armed Services strategic forces subcommittee, said the missile test followed seven years of "slash-and-burn" cuts to missile defenses. "Obama's assumption that if we stop developing missile defense for the homeland, others would stop working to hold us at risk with the world's most dangerous weapons was always foolish. It has now been proven dangerous," Rogers said. Rogers vowed to bolster missile defenses in the fiscal year 2017 defense bill "to rebuild after eight years of Obama's leading from behind." International reaction to the North Korean missile launch involved widespread condemnation. In Tokyo, Japanese Prime Minister Shinzo Abe told reporters the missile launch was "totally unacceptable" and said Japan was prepared to unilaterally impose new sanctions on North Korea. Japan’s government said it had activated a nationwide alert system within three minutes of the missile launch. Japan is also considering upgrading its Aegis missile defenses ships so that it can use longer range SM-3 Block IIA interceptors. South Korea also called for new sanctions. China provided a mild rebuke, with official spokesmen voicing "regrets" and calling on regional states to react "calmly." 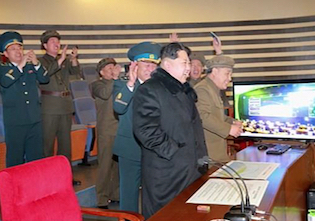 In North Korea, state-run media reported meetings throughout the country celebrating the successful satellite launch. Fireworks displays were reportedly held in the capital on Monday in celebration. Central Committee Secretary Kim Ki Nam was quoted as saying the launch was a "great national auspicious event" demonstrating the country’s independence. "U.S. imperialists and the forces following them are making provocation, calling the successful launch of the satellite a ‘challenge’ and ‘violation’ but satellites of Juche [state ideology] will continue to fly into the blue sky of the country," Kim was quoted as saying. Russia’s government said the launch violated international law. This entry was posted in National Security and tagged China, North Korea, South Korea. Bookmark the permalink.